I have considered the CX-5 but its just feels small (traded in my Tacoma truck) even though I don't haul passengers but do need a SUV to tow jetski/trailer combo of 1200lbs. Currently own a 2016 MX ND that I drive daily. For the current generation of the CX9, are they going to change to a new body soon? Don't want to purchase something and have it change. I don't think there is any change expected. They have been refining that car since it introduction in 2016 and it is now is really in fine form. The only nit would be the 360 camera on the 2019. Is there any chance the CX-8 body could make it here in the USA? Last edited by CrazyBiker; 01-02-2019 at 12:29 PM. Yes that is the problem. The CX-9 is larger ( wheel base and overall length) than some of the other "mid-size" SUV's but the cargo space is on the small side. It's enough for me but it is a much larger vehicle than the CX-5. I'd be taking a strong look at the CX-5 turbo models but when they lost almost 6 Cubic ft of cargo space they kind of lost me on that vehicle. It's just too small. The CX-8 would fill the gap nicely. I'd hate to throw down on the current CX-9 only to see either a full refresh or the CX-8 show up in the next 2 years. Got a price for a 2018 CX9 touring with premium pack of 32751.00 with eplan and rebates added in before Tax and other fees. Is this good?? Im in the middle of an over-night test drive on a 2018 CX-9 GT AWD (metal gray/black). It's was a dealer driven car with 5500 miles on it. Sold as new so full factory warranty from today and will extend the mileage to 41k miles. Current negotiated deal is $34,675 before fees but I don't pay sales tax as a Montana resident so just a doc fee blah blah for another $400.00. They are showing me 18k for my 2016 CX-5 GT AWD and that's fair. They tried to close me today by saying the employee discount expires tonight and that was where they were getting some of the discount from. I'll let them know tomorrow. Price fair. I may get further but the bottom line is is it worth another 16k to drive a slightly used CX-9 over a 2016 CX-5? Its a bigger more solid car for sure. Wife drove it and liked it partially because with a few exceptions it is the same car inside other than space. That's one of the things I don't like but I never dis-liked the CX-5 interior. Just a little small. So is this a good way to go? Dealer car... 5500 miles. The color I want etc for a substantial discount over a new 2019. I know vented seats are great but never used them all that much unless it was very hot out. The 360 camera on the 2019 is not well received and they can reboot Apple car play and make the head unit the same as a 2019. I do like the new gauge cluster on the 2019 but is it worth another 6-7 grand. Not sure. That sounds like a very good deal. I like CarPlay and if they add that, I would go for it. Dealer here today where I am possibly buying a 2018 said the "re-do" of the CX-9 would be 2021 0r 2022. Who knows if he's got real information. Knowing Mazda it won't be a radical transformation as far as the body goes but there will be updates on many things inside the car. It will be interesting to know how long they stick with this 6 speed transmission. They will almost be forced to add gears at some point it seems. Oh well if it ain't broke why fix it? I should also add that the car has the front/rear bumper trim option (do we like that?) and 1600 bucks worth of dealer add ons including full window tinting ( looks great with the gray) the $995 "paint armor" protection and film in the door cups and door edges. Those uncharges went away. There was also an uncharge for Nitrogen in the tires 200 bucks.. Wow the things they come up with. I work at a large Plex with a Mazda store in it? When you say 'dealer car" do you mean a service loaner or a salesman demo?? Big difference between the two since loaners tend to get driven long and hard because most people are pissed that their car is in the shop. A salesman car is different and they tend to get a lot of TLC . How many miles on your trade? ?I traded a Cx5 gt with 25k on it and got 19500 along with rebates and eplan discount for a 18 Touring , didnt feel the GT was worth the extra cost . I like the trim option a lot and looks very nice on the grey and red cars. That sounds like an even better deal. Posts some pics when you have the car in hand! My car is getting a clear bra, ceramic coating and windowing tinting as we speak so I am interested in seeing what your car looks like (mine is grey as well). $200 for nitrogen is nuts. They tried $150 for me! Get the paint armor in writing and the warranty information. They will say lots of stuff but never provide the information. Hey did you end up going for the Dealer car? I am looking at very similar options (Dealer/Loaner) with about the same mileage, either 2018 Touring with Pref Package or 2018 GT. List prices are almost the same (around 36k). Were you able to do a fair amount of negotiating? Let me know if you bought! I did buy the dealer driven 2018 GT AWD. (It was the sales manager that had it. I talked to him about it) They actually had two of the identical vehicles and had just sold the other one. Obviously with 5500 miles on the clock, 2019's sitting there and it's an AWD which they don't sell many of in Phoenix the negotiating was to my favor. They started high and came down twice as I was headed for the door. 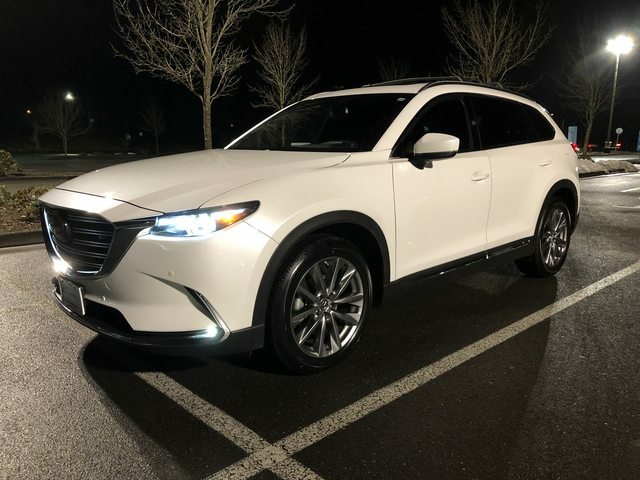 They gave me a fair trade in number on my 2016 CX-5 GT and the net additional cost of the CX-9 was about 15k I got them to throw in the Car play upgrade,cross bars for the roof and another year of warranty ( 4 years B to B). That was the difference I had to see to make it make sense and getting last years model with some miles on it was fine with me ( primarily wife's car she doesn't care as long as it runs). I paid about 35k for it. No sales tax as I am a Montana resident. I'd say if you could get a similar used or CPO 2018 GT AWD for anywhere around 35k your doing good. Unless things have changed that dramatically in 6 weeks. Great car so far. Everything I expected it would be and then some. I just took home a 2018 Signature in white with only 4500 miles for $35,950. I internet shopped for a few days and agreed on a price through email and I was in and out of the dealer in an hour with my new car. The car is in perfect condition and still has that new car smell. It even came with several bonus accessories like the cross bars, illuminated door sills, and all weather floor mats. Me and the wife absolutely love this car. We went to test drive a 2019 Signature at the local dealer but it was so far out of our budget (47k sticker price). Congrats and that sounds like a great deal. There are some advantages to getting a "new/used" vehicle from a dealer. If you don't mind a few miles on the clock you can really save some money get some extras as well. The 2019's have a few extra features but not critical ones in my opinion. Car play was the biggest and now mine has that. Was this car the dealer had driven? Great car. Enjoy it.. I bought this one from a VW dealer. Someone traded it in for an Atlas for more 3rd row room. I was also working with a Mazda dealer that had an identical CX-9 Signature in white with 3700 miles except theirs had a CPO guarantee but their car was a Fleet / Dealer loaner car which was a huge turn off for me. I noticed it's leather had significant wear compared to the one I bought. I wish it were easier to post pics on this forum. Last edited by jefabian; 02-27-2019 at 12:15 AM. Mazda CX-5 2018 Release Date?